3.8 out of 5 based on 109 bloggers and 16 commenters. Versatile is a free blogger template with 3 columns, magazine-styled, right sidebar, an exclusive design for Blogger, ads ready, footer columns, slider, posts thumbnails, tabs and geometric motifs. How do i change this to English? Great job i love it!! I haven’t tried it but here it shows an icon for downloading the Enligh version of it..
Having loads of trouble – Can’t upload this template to blogger.com! Any general troubleshooting reasons? Really This is a nice Template and I will use it for my blog. This is a great template but if your readers don’t speak spanish they are going to have issues. I have tried for hours to translate from Spanish to English with no luck. It’s really to bad because it is beautiful to look at. Please help me how I can change the picture upp I dont like them ? Por favor, ¿podrías decirme cómo cambiar las imágenes de la cabecera? 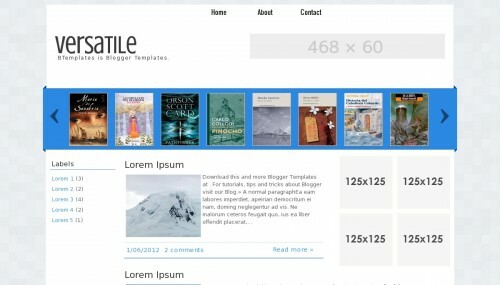 this template is nice for my blog but i want image slider separately header imager slider and footer slider also any idea ? nice template, how change to english?? If there’s any way to do so, I’d love to know. This template looks great. I am going to try it for my blog. Thank you so much!